Do Your Kitchen Floors Need to be Replaced? / Industry Blog / Do Your Kitchen Floors Need to be Replaced? 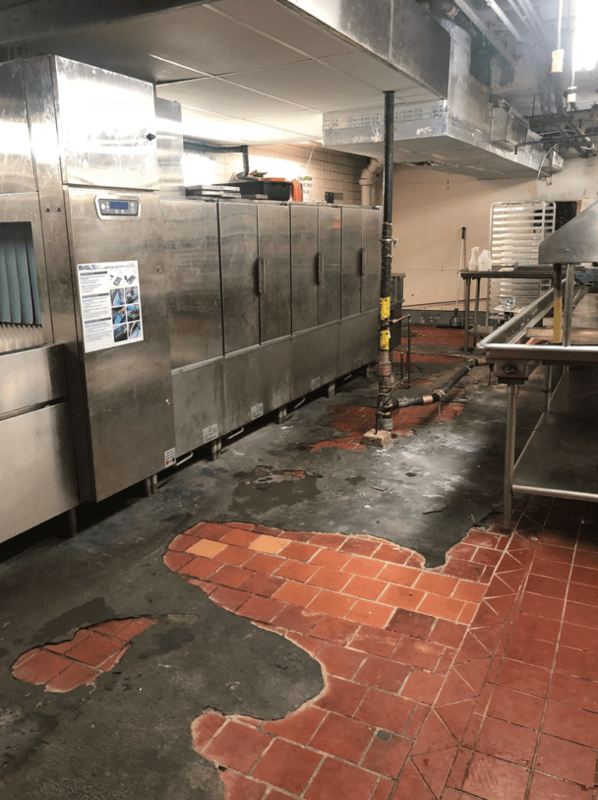 Damaged and failing equipment in the food service industry can be detrimental to a business and expensive to replace. Overtime, high traffic areas can be worn from age, lack of maintenance, water damage, or just general wear. This can apply to anything from mixers and grills to walk-in coolers and kitchen floors. 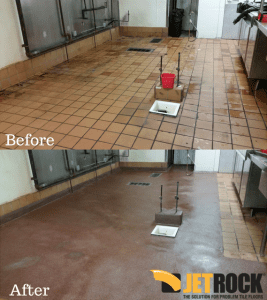 Floor tiles are a common material used in commercial kitchens and are subject to wear and tear resulting in cracks and overall failure. Ceramic floor tiles can crack and break from a variety of reasons: improper sub-floor, inadequate mortar adhesive, faulty tile, and heavy objects. Ceramic tiles begin to fail if the grout around them wears down and water is able to penetrate. 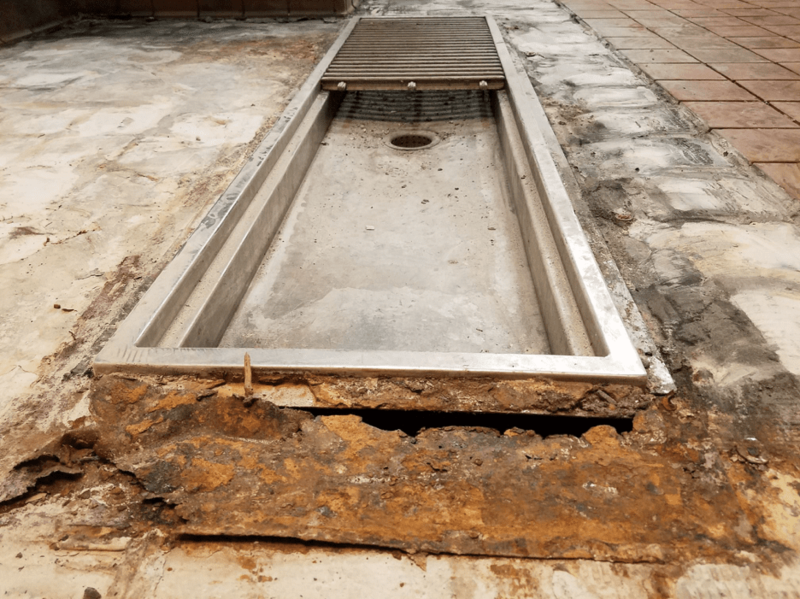 Once water is able to penetrate tiles in any way (most commonly from eroded grout or tile glaze), your floor will begin to smell due to bacteria-ridden, water-damaged, and mold-friendly conditions. 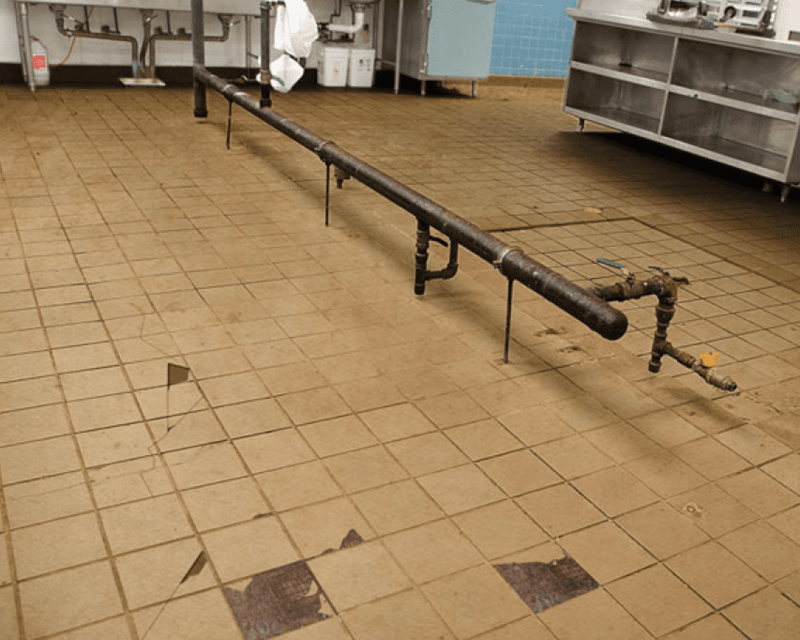 In many restaurant kitchens, broken and cracked tiles go unaddressed for long periods of time resulting in a need for more extensive repair or even replacement. If you have encountered issues such as cracked tiles, bad smells, mold, mildew, or bacteria from water damage, and trip hazards, you may want to consider a floor replacement. A commercial kitchen undergoes extreme wear and the material you choose should be able to withstand it. 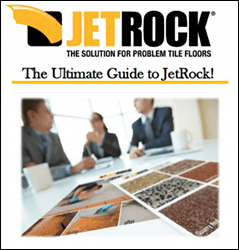 JetRock is the ULTIMATE back of house flooring solution. It is installed right over existing damaged floor for a quick and easy turnover. If you are looking to replace your kitchen floors, you should look for a product that Fast to install and Durable enough to last over time. The Problem: cracked, broken tile floors with deteriorated grout lines that are dangerous, unhealthy and unsightly. The Call: made to JetRock where you speak with a qualified, knowledgeable representative. The Site Visit: a trained, qualified JetRock consultant visits your location to take exact measurements, in order to create a detailed proposal. The Quote: will be accurate, fair, and thoroughly explained by your consultant at JetRock. The Project Plan: detailed and thorough, this plan illustrates how the new floors will be installed. The Schedule: set to accommodate your operation’s business hours to minimize downtime. The Install: performed when it best suits you, following the project plan, the JetRock floor is applied directly over the existing problem floor. The next day begins with a new JetRock floor! Customer Care: JetRock will follow up with you to ensure your satisfaction after the installation. If you ever have questions or require additional services, our staff is ready to help you for the life of your floor. Why you should say “NO!” to grout and tile. ©2018 JetRock, Inc. All Rights Reserved. Digital Marketing by SPARKS!